Derale Transmission Cooler - Heat Sink UNIVERSAL - Dezod Motorsports Inc - Home of the automotive performance enthusiast since 2002. This compact all aluminum two-pass Heat Sink cooler kit uses both external and internal fins to maximize heat transfer. With a 3” diameter it can be mounted in a variety of locations. With the inlet and outlet ports on the same end mounting in limited space applications is much easier. 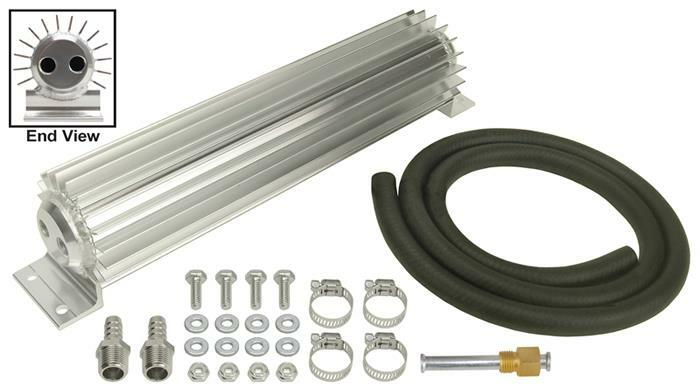 This kit comes with a complete transmission cooler hardware kit to easily install onto vehicles with 5/16” transmission cooler lines, making it a perfect solution for light duty transmission cooling needs.